Gemma fell gravely ill beginning in September, 1902. At first, she was able to leave her bed for a short time with great difficulty to attend Mass and receive Holy Communion. But eventually as her illness progressed, she was compelled to offer to God this sacrifice of total confinement, amidst ever increasing pain and suffering. 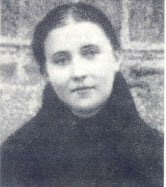 In “The Life of Saint Gemma Galgani” Father Germanus writes “I received letters saying: ‘Gemma is very ill. She is reduced to skin and bones; She suffered excruciating torments and internal pains that terrify. One cannot bear the torment of not knowing what to do to relieve her. Gemma desires to see you. Come quickly to tell us what we should do’. On receiving these pressing requests, I determined to go. The poor child showed the greatest joy when she was told of my arrival, and she wished to get up to welcome me. Imagine my grief in finding her in such a state, added to this my fear that this time God would act indeed. (in a previous serious illness the year before, Father Germano ordered her under obedience to ask Jesus for a cure, and Jesus honored Father Germanus’ request and Gemma was temporarily cured. This was the 2nd time she was miraculously cured. This is why Father Germanus fears ‘that this time God would act indeed’ –editor). “Go to Jesus, Father,” she answered in a tone of inexpressible joy. At this point I cannot understand why she went into the most minute particulars concerning her death (Father Germanus then explains all the details that Gemma gave him concerning her upcoming death). The majority of the doctors who evaluated Gemma declared that she had tuberculosis, however given the variety of symptoms, several doctors thought it was something new and unknown, but all agreed that there was a good possibility of it being contagious. Therefore the doctors along with Gemma’s spiritual director, Venerable Germanus CP, insisted that Gemma be removed from the large Giannini family, for fear of it spreading to the family members, especially the children. The Giannini family had “adopted” Gemma after her Father died a few years earlier. They were a large family, consisting of the parents, Aunt Cecilia (Gemma’s “adopted” Mother) and 11 children. Each one of them loved Gemma dearly, as is attested and verified in interviews of the official process of Gemma’s canonization. Thus the entire Giannini family protested the request from the doctors to remove Gemma from their home, but after many months of persistence from the doctors, Father Germanus, and others, it was decided that Gemma be moved to an apartment across the street from their home on January 24, 1903. "The sacrifice is made ... my angel has gone. This evening she is at the apartment across the street, and already I have made three visits. She embraced me and cried: "Mamma, Mamma, now I have lost a mother twice." Poor martyr! You can imagine, Father, what tears I shed, I could do nothing else; what torment! If you knew how unhappy these chil­dren here at home are without her. Do write to dear Gemma and console her if you can. . . . Poor little thing! Tonight she is alone, alone with Jesus. She says always, "Jesus only!" Tomorrow after I have gone to Holy Communion, I will bring her coffee as usual. Again Cecilia Giannini writes: "Poor martyr...poor victim of Jesus! She suffers without the least respite, and feels that her bones are being disjointed. She is tortured in every part of her body, and is gradullay being dissolved in terrible agony. For the past twenty days she has been unable to see,her voice is so feeble that she can scarcely speak, and it is almost impossible to hear what she is trying to say. She has become a mere skeleton, and it fills everyone with grief to look at her." At times she was left entire nights alone, and she nver complained to anyone about this abandonment. Later, in order to prevent this, the Nursing Sisters of the order of Camillo de Lellis were called in to assist Gemma. "Never throughout her long illness" states Euphemia Giannini "did she ever even ask for a drink of water." During her last months the devil almost continually tormented her, hoping that through her physical weakness he might find a way to drive her to despair. On one occasion he made her food so as to appear as repulsive insects, and the demons in hideous forms would appear near or on her bed. On one occasion she felt a demon in the form of a serpent seeking to coil itself around her, which caused her to let out a frightened cry. She asked for an exorcism on several occasions, but her confesssor did not judge it necessary, and would recite only a short prayer along with a blessing. In intense pain, but with her heart all on fire with love of God and souls, Gemma enters into Holy Week united with Jesus on the Cross. Father Gemanus writes “The cruel malady had run its course. Gemma had nothing more left than a breath of life. Her whole body was in agony, the pallor of death was depicted in her countenance, and she was stretched motionless on her bed in an aspect so pitiable, that one saw in her an image of Jesus expiring on the Cross. Four of five days before she died, she became so heavy that three strong workmen could scarcely lift her, although she was reduced to skin and bones, and so slight in figure that a child might have moved her. One of the Nursing Sisters assigned to her from the order of St. Camillus de Lellis said "We have cared for a great many sick people, but we have never seen anything like this”. They expressed their wonder of this to Gemma who said ‘It is not I, you know, that weighs so.’ And it was noticed that she had no sooner expired than she returned to her natural weight. (editors note- Father Germanus suggests that the devil had something to do with this for some malignant end. I have read elsewhere that mystics, in a state of ecstasy, may at times be likewise practically immovable. This "mysterious weight", making the body immovable, was a common occurance in the life of the mystic and soul victim Marie Rose Ferron. Her spiritual director, Rev. Father O. A. Boyer details this phenomenon in his book on Marie Rose Ferron entitled "She wears a Crown of Thorns". In then end, perhaps only God knows what causes such a state in His soul victims). On Thursday of Holy Week, Gemma recieved Holy Viaticum. "She seems a Saint", stated a witness, "sitting in bed, with her hands joined, and her eyes downcast, her face all radiant and smiling, in spite of the relentless illness that was consuming her." After recieving Holy Communion, she remained in prayer for two hours, and then she was taken into ecstacy where she seemed to behold a Crown of Thorns. She said "Before Thou are finished, oh, how much more has to be gone through!" Then, turning to a Sister she said, "What a day tommorow (Good Friday) will be!" "At 10:00 am on Good Friday morning, Cecilia who had been assisting her throughout the early morning, feeling that she herself was growing faint from fatigue and loss of sleep, decided to go to her house close by and rest a little, but Gemma said to her: "Don't leave me until I am nailed to the Cross. I have to be crucified with Jesus. He said to me that His children have to be crucified". This good lady remained and behold soon after the suffering child entered into an ecstacy, opened her arms by degrees and remained thus until 1:15pm. Her appearance was a mixture of grief, love, desolation and tranquility. She never spoke, but yet her silence was most eloquent. She was in agony with Jesus Crucified. The bystanders gazed at her with great attention and awe. One of them wrote to me as follows: 'Look at Jesus dying on the Cross; that was the appearance of Gemma in those moments.' She continued to suffer the rest of that day and night, into Holy Saturday morning. "At 8:00am on Holy Saturday, Gemma recieved the sacrament of Extreme Unction, with great devotion and the full exercise of all her faculties. Her spiritual director, Father Germanus, was far away in Rome. Cecilia began to prepare a telegram to call him at once, but Gemma withheld her and said "I seek nothing more. I have made a sacrifice of everything and everyone to God. Now I prepare to die. Father Germano will come after Easter" -And in fact he did. As the morning wore on, the devil appeared once again, this time in the form of a black, ferocious dog. Gemma asked once again for an exorcism, so Cecilia then went to get her confessor, Monsignor Volpi, who knew her since she was a child. He replied: "Tell her if it if to hear her Confession, then I will come. If it is to assist her in her agony, then there is the Curates." [ie-parish priests] This reply seems harsh, but it must be remembered that Mons. Volpi was the auxiliary Bishop of Lucca, and Holy Saturday was an exceptionally full day for him. When Cecilia returned and told Gemma Mons. 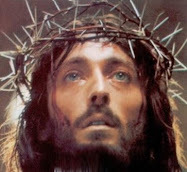 Volpi's reply, she took the crucifix in her hands and said: "You see Jesus, I really can do no more. If it is Your will, take me." Then turning to the picture of the Blessed Mother on the wall she said "My Mother, I commend my soul to you. Tell Jesus to be merciful to me." After the solemn midday ceremonies were over, Monsignor Volpi had enough time to pay Gemma a hasty visit. Her gave her a blessing and asked her if she was now satisfied. Gemma replied "no" and asked him for a real exorcism. "I must go to wish the Archbishop a happy Easter" he replied, "but I will come back and see you later on." It was the last time he saw Gemma alive. At about 12:30pm, seeing that death was soon approaching, Cecilia ran across the street to home and interrupted the rest of the Giannin family who were eating their midday meal saying "Gemma is dying!" The whole family, both young and old, rushed to be with their beloved Gemma. Gemma then raised her feeble voice and said "Now it is indeed true that nothing more remains to me, Jesus. I recommend my poor soul to Thee...Jesus!" These were Gemma last words. The victim was offered, and nothing now remained but to breathe her last breath in completion of her sacrifice. Another half hour passed. Gemma then kissed the Crucifix that she held in her hands, and then placed it on her chest and keeping both hands on it she closed her eyes and remained motionless, as if in prayer. Gemma is seated on her bed, her head resting on the shoulder of one of her benefactresses. Her youthful fried, Euphemia, kneeling before her with her head bowed down like the Magdalene at the feet of the dying Christ, is holding Gemma's hand pressed to her own breast. The nursing Sister and all the members of the Giannini family are standing around contemplating the affecting scene. Gemma remains with her eyes closed in an apparent prayer. Then, quite suddenly, while all eyes are fixed on her angelic face, still beautiful despite the ravages of such an illness, she smiled a heavenly smile and, letting her head drop to one side, ceased to live-just a the Gospel tells of Our Redeemer on the Cross: 'And bowing His head, He gave up His Spirit'. No one percieved that she was really dead, for besides having no specific agony, she underwent no muscular strain in breathing her last. There was no sigh of oppression or suffocation. Her last movement was like a smile of salutation and nothing more, a bidding farewell to her innocent body. A few minutes before, the Parish Priest, Rev Abbot Angeli, of the Canons Regular of the Lateran, arrived and began the last prayers. After a few moments he stopped mid-prayer and asked "Is she dead? " "I have been present at many death beds, but never have I seen anyone die like Gemma, without any precursor sign...not even a panting breath. She died with a smile which remained on her lips, so that I could not convince myself that she was dead." Yes, what a wonderful thing it is to die on the Solemnity of Our Lord's Ressurection (Vigil of Easter), after having kept Good Friday on the Cross with Him, sharing in all His agony!" Some of the people took flowers from the crown that was placed on her, some touched objects of devotion to her hands and feet and others tried to get some of her hair...."
Gemma Galgani of Lucca, a most innocent virgin, while in her 25th year, consumed rather by the fire of Divine Love than by the violence of disease, flew into the arms of her Heavenly Spouse on Holy Saturday, the eleventh of April, 1903. Peace be to Thee, O sweet soul, in company with the Angels"
Dear Jesus, I love you so much! I shall endeavor always to love You; I shall live to love You; I shall die to love You!....Give me wings oh Jesus, so I can fly to Your throne!" she did indeed die a very holy death! what a wonderful saint she is! Yes, she sure is a wonderful saint! Thanks Marilena for your comment. She was strong and valiant young woman. I wonder how many of us want to die like her and go to heaven. Only idiots would not want to. Unfortunately, most do not care. 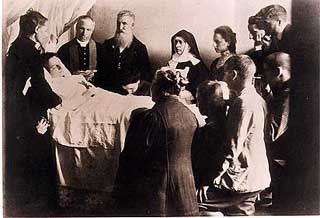 I was wondering if you could confirm something for us: Is the photo of St. Gemma, on her death bed and surrounded by a variety of people (including a priest, a nun, some people kneeling, etc) an authentic photograph? Thanks! I've certainly wondered the same thing about this photograph. I know that Father Enrico Zoffoli does not talk about this photograph at all in the section of his hagigography "La Povera Gemma" where he discusses all the photographs of St Gemma. So, I would have to conclude that it is probaly not authentic, however to see if we can get any further info about this photo I just emailed the Postulator General in Rome to see if he might be able to shed any light upon this particular photo. I will post his reply here when I receive it. "There is a picture, with some differences, from a picture in my possession; so I suppose that the photo is genuine, though not in my possession. Regards..."
So it appears that this photo could indeed be authentic. I will post again here if I find out any further information. I think other things might have been going on here. Abuse, escapisim, and mental problems..I am sorry to say this, but I have a sister who has caused ME great pain in my life, MY WHOLE LIFE...I am happy to be alive, she wants to die and never be alive in the world. She causes a lot of people great grief, and gives no explanation...for her misery, but make an excuse like this, because she won't take medicind which could turn her life AROUND! This is her, and a great excuse for attention. So very sad for this, and to make her a saint...God nor Jesus WOULD EVER ASK THIS OF ANYONE, or want this for you in your life. This is not what they do. GOD AND JESUS support life not this kind of behavior. You should be ashamed of this. This girl was very sick phycologically and needed help when it was not available in society during this time. This is a very sad thing. Bless this girl. And bless the people posting and reading....Geesh! "God nor Jesus WOULD EVER ASK THIS OF ANYONE, or want this for you in your life. This is not what they do. GOD AND JESUS support life not this kind of behavior." Why then, would you say, did Jesus become man and suffer and die a horrible death on a Cross? 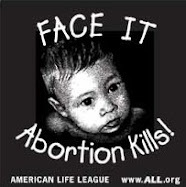 If God only "supports life and not this kind of behavior" as you say, then why did He become man, allow Himself to be mocked, whipped, scourged, made to carry a cross, be nailed to it, and then hang upon it for three long hours until His death? Thanks for your comments and for sharing your thoughts. God created heaven and earth by a word. He said "Let there be light" and there was light. But God could have said "Let there be salvation". Why didn't he do that !! He sent his only son to suffer and die for us. His whole life (not just the passion) was full of suffering and misunderstanding -- e.g., A prophet is never accepted in his hometown. Jesus felt hurt!! When the Son of God suffered it means real suffering. He suffered physical, emotional, and mental pain. That is why suffering is called a "Mystery". We people with our small brains cannot understand the actions of a mighty God. This Saint suffered so much for the salvation of souls and you are calling her a psychological wreck. Then what do you call yourself? A "spiritual wreck" I suppose. It is not necessary to understand God. We must love him more. In regards to the sufferings of some of the Saints, it is indeed a mystery. First of all, the canonization process of the Church is extensive and takes many years. Part of that process is the psychology of the person in question. The Catholic Church raised Gemma to the altar of Saints, and would have not done so, if there were a shred of doubt concerning her mental condition. I am new here Glenn, as St. Gemma made herself known to me about a week ago. I have been pouring over the info you have here, and wanted to thank you so much for the time and efforts in what I know is a labor of love for you, and a joy for those of us you have blessed here. Could it be said that St. Gemma was a "Martyr of the Eucharist"? Possibly, given her great devotion to Jesus in the Blessed Sacrament, but Gemma is more recognized for her mission as a victim soul for the conversion of sinners. I just did an ancestry search & found that I am related to the same branch of the Giannini family that took care of Gemma, & I'm so happy to have a connection to such an awesome family. St. Gemma is very special to me. I want to thank you for putting up & maintaining this beautiful site, Please pray for me, I am a sinner & a drug addict. 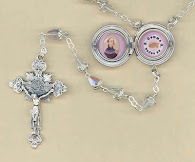 I hope that St. Gemma will help me in my recovery, My family is all dead & Im the only one left. I feel so alone at times. I hope people will pray for me. Thank you.